1961 Facel Facellia - Facel began building car bodies for Simca, Panhard and Ford France shortly after WWII. In 1954 they started building their own car, the Facel Vega. This was a large, fast, luxurious, expensive car, powered by Chrysler V8 engines. Built in limited numbers, it sold well, especially in the US. Jean Daninos, founder and chairman of Facel wanted an all French sports car that would compete with Alfa Romeo, Triumph and MG. He developed the Facellia. It was introduced to the public in 1960. The Facillia was a success on every level except one. The suspension was similar to the Vega, and typical for the time. 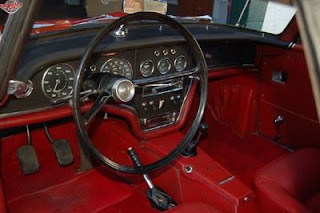 The interior was loaded with leather and had a full compliment of round gauges. The body was drop dead gorgeous. 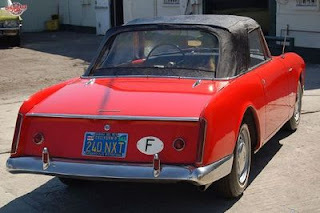 Based on looks alone, nothing from Alfa, Triumph or MG could compete with the Facillia. The big flaw was the engine. Daninos wanted the car to be all French and commissioned Pont-à-Mousson - a company that built transmissions, but had never built an engine - to build it. It was a disaster. The engines failed early and on a regular basis. The cost of replacing the engines was too great for the tiny Facel company. 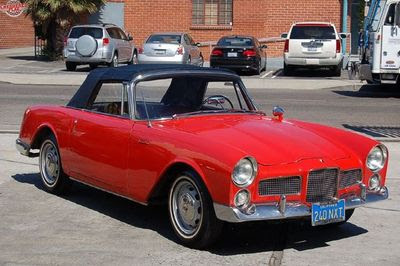 The engine was eventually replaced by a Volvo engine and later by an Austin Healey engine, but the damage was already done to Facel's reputation and finances. In 1964 the company folded. This car appears to be an older restoration. The paint has some chips and the windshield is cracked. The Pont-à-Mousson engine smokes and the seller suspects it may need new rings. Looking at the pictures and the beautiful details of this car makes me wonder where this company would be now if the Facillia had a better engine. Located in Marina Del Rey, CA, click here to see the eBay listing.